You are here: Home / Sponsored / SmileBrilliant Teeth Whitening System! I got the chance to try out SmileBrilliant lately. I was so excited to try it! You see when I was just a baby the Dr. prescribed a medication for me that they didn’t realize discolored teeth. So, as a result I have always had yellowish teeth and I have hated them. But, I was told there was nothing I could do about it. Once teeth whiteners hit the shelves I tried one and it didn’t work, so, I went back to knowing there was nothing I could do about it short of paying tons of money to have them covered or painted over or whatever they do at the Dentist that costs a fortune. 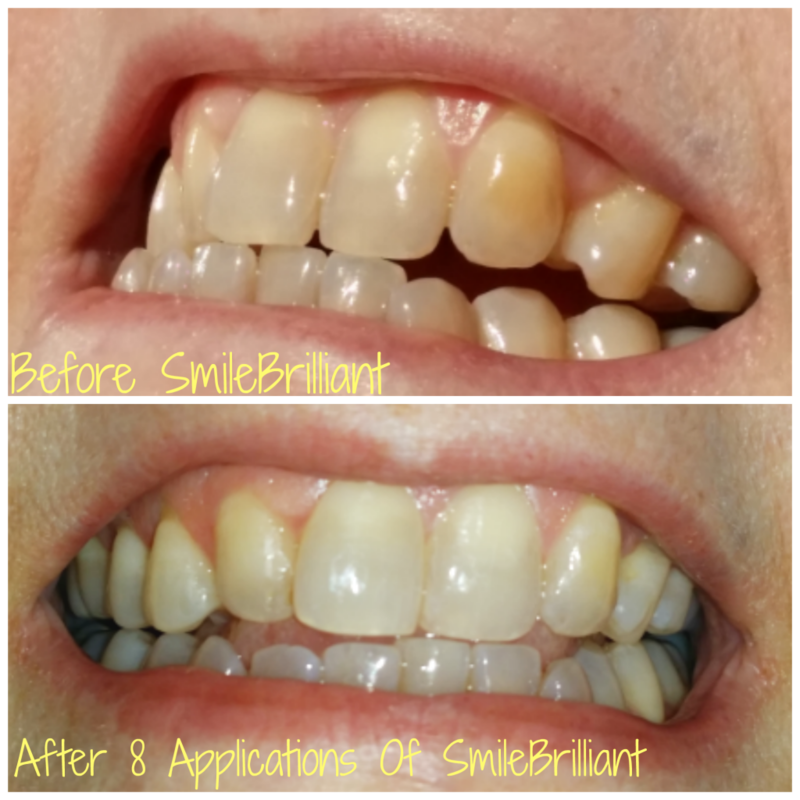 Then I got an email from SmileBrilliant and they said they’d like me to try their product and I replied and thanked them for the offer but, explained my situation and told them they couldn’t help me. They responded that that was not a problem for their product, they said it would take a little longer than most, but it would work! I have to tell you I was excited when they told me that, yet still skeptical. I jumped on the chance to try though! They sent me a kit to make molds that fit my teeth, I followed the instructions and sent the molds back and quickly got the trays back that fit my teeth perfectly. They sent a case to keep them safe in as well as the whitener, and a desensitizer in case my teeth were sensitive, as well as complete instructions. I have used the product less than 10 times total so far and am shocked at how much of a difference I have seen already! I can’t wait to see the end result and it’s really been so simple. I do have sensitive teeth and so, I do wait a few days between using the product. All you do is add a little strand of gel to the molds and pop them in for a while and that’s it! Smile Brilliant custom fitted teeth whitening trays are hand crafted by dental lab technicians which means they are formed to fit to your teeth with precision. In the past a visit to the dentist was required accompanied by a price tag of $500+. Those days are long gone because of Smile Brilliant’s lab direct custom teeth whitening trays. Our whitening trays are identical to those provided by the dentist, but our price tag is not! 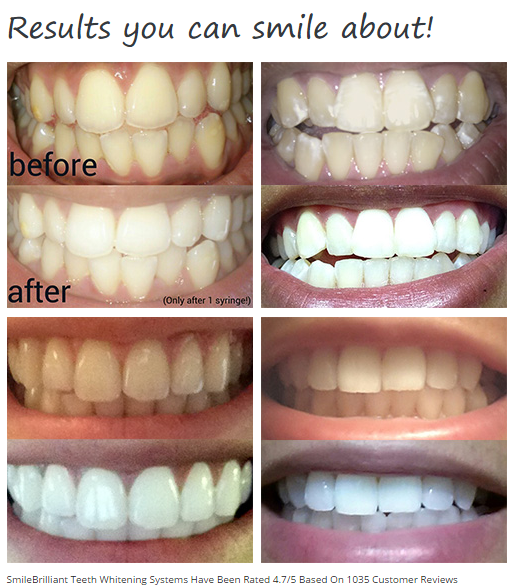 Save as much as 70% at Smilebrilliant.com on all things teeth whitening! Professional teeth whitening gel – Dentist-strength 22% Carbamide Peroxide in 3ml syringes. Smile Brilliant is one of the fastest growing retailers of teeth whitening products in the US! To learn more about the process and get started yourself, head over to the SmileBrilliant page!